Missile defense system prevents damage from latest attack from Gaza terrorists. Residents treated for shock. At least three rockets were fired at Israeli territory from the Gaza Strip Wednesday evening, causing the red alert siren to sound in Israeli communities near the Gaza border. The Iron Dome missile defense system intercepted two rockets. Residents of the city of Sderot witnessed the interception of one of the rockets overhead. United Hatzalah said that its volunteers were treating several residents of Sderot for shock following the rocket attack, as well as a man who suffered injuries when he fell while running to a shelter when the red alert siren sounded. Eli Beer, President and Founder of United Hatzalah said: "We look upon this serious escalation of rocket fire from Gaza with a sense of trepidation. Our volunteers are always ready to provide first aid treatment to anyone who needs it in the area. With the influx of rocket attacks on the area, we opened a Psychotrauma and Crisis Response course to train professional psychologists, psychiatrists, therapists and doctors to be able to provide psychological first aid and stabilization to those suffering from shock as a result of these rocket attacks. Our Psychotrauma and Crisis Response volunteers from around the country have been incredibly effective in helping to stabilize people in emotional distress following a traumatic incident since the unit's inception. By extending our unit's capabilities to cover the Sderot and Gaza periphery are, we hope to provide the population that lives under constant threat of rocket attacks with the help they need when they need it. 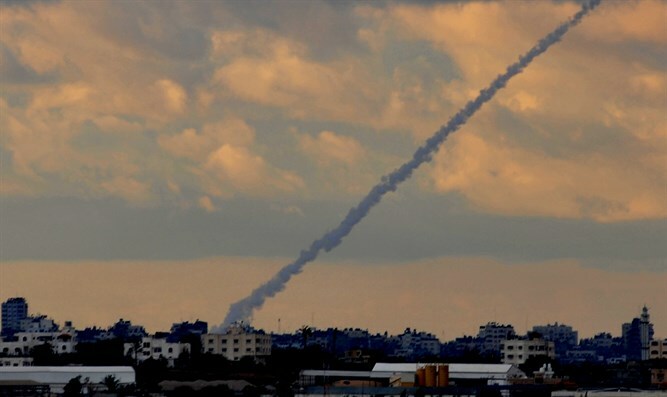 A third rocket was later fired from Gaza and landed in an open field. At least 13 rockets have been fired at Israel from Gaza since US President Donald Trump's announcement that he would recognize Jerusalem as the capital of Israel last Wednesday. One rocket struck a preschool in Sderot last Friday. The building was damaged, but no one was inside at the time.